I'm so in love with this color that I want more gray hair! You look fabulous....that's the look now .... Even my 17yo wants grey hair. cathe - looks great on you. I will tell you my husband does not gray or silver - sounds like yours would agree. Let ne first say i have yet to see you in a wig tyat did not look great. Those same wigs do not necessarily look great on me. Sorry but i think gray does “age” older people, and draws attention for younger folks - almost like purple hair. That said - your particular color and style makes you look very cool. I will say your other colors make you look younger imho. The question is why we are all so afraid of looking older in the first place. I think with gray you need a young style to offset - and you have done that here. But we all associate gray with aging. My husband thinks shaded bisquit is too silvery. So i have given in - temporarily - and wearing shaddd praline which is similar but different. After all - he has to look at it and i realky dont. Hair up close! Makes me want gray! Thank you! Cathe, this is gawgeous! I feel that as a Long islander, I can say that LOL! You're lucky to have such nice coloring that so much looks so good on you! I don't have the nerve to go gray quite yet. It's a big leap from midnight brown, but I'm slowly going lighter with my wigs. I plan to get to medium brown this year. I like greys on older women. Many women I know are not covering their grey, and wearing their hair long. I'm in my late 60's myself and prefer wig colors that look natural for my age. My own fine, thin - and getting thinner as I age - hair is medium brown with grey strands, especially at the hairline and temple areas. I look for transitional grey colors like JR's color #38, a medium brown with 35% grey evenly mixed throughout, which is a close match to my own hair. I hope that wig manufacturers will offer various greys in a wider variety of styles. For example, I like Ellen Wille wigs but their color range, especially in greys, is very limited; their men's wig line offers some nice transitional greys that I would love to see in their women's wigs. I'm with you on wishing that wig manufacturers would offer more in the grays. It's funny because I never thought I would embrace the gray but after wearing that one Jamison, I've ordered another gray wig. Long and gray look lovely on the mature women and I think wig manufacturers need to be aware that women who are of the mature demographic no longer want those "granny" looking wigs. We want stylish and modern and longer wigs in more grays!!! LOL. I have noticed that the younger crowd is enthralled with the gray hair! I'm still trying to wrap my head around that one!!! Thank you! LOL--My husband cannot stand me in the gray but he knows I'm going to do what I want anyway. You bring up a good point. I don't think it's that we don't want to look OLDER, personally, I just want to look my age--only the best version of my age and that's where the issue lies. I also blame the beauty industry big time because they are always using the vulgar term "Anti-aging" as if aging is a bad thing--fact is, the moment you leave the womb you age. It should be called "pro-aging" and then maybe the tide will change!!! It's not like anyone would look at me with a shaded praline wig and say - gee - she must be "young" to wear have that color hair - or that anyone would think that at my age that might be a natural color on me. However, it has LONG been accepted for women to color their hair - so that part is not an issue. Now, your gray wig looks stylish and kept up, etc. The style says - I am not "OLD" in the sense of "giving up and waiting for the big event", but instead says I may be gray but I am cool and have a "current" style. It is more about mindset and less about actual color. I actually think (partly because of skin color and skin shape) that I look better in a color that "has more depth and color - as in not so gray. But, that is me. As I said - I have yet to see a color or a style that does not look great on you. I am sure your hubby feels the same way. This really looks great on you, as do all the wig pics you post! I like the color and style. I do wonder about the roots though.........when hair turns gray it is gray at the roots, not dark roots and than the rest of the hair gray. It kind of looks to me like someone had dark hair to start and dyed their hair gray and as their hair grew the gray started to grow out. That being said, I think it looks beautiful on you. My husband actually loved my bio hair when I let it go gray a few years ago, when I had thicker and more hair! I do see myself in a youthful gray wig someday......when my husband goes all gray. He has no gray hair at all.. I ordered Brady by Noriko in Bubblegum-R because I thought I would like the color, it looked great on Taz. 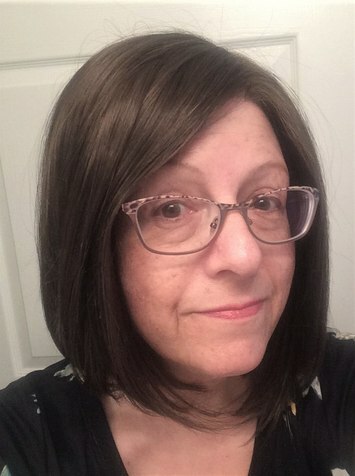 When I received it I loved the youthful style but the color made me "feel" older....I know it is all in my head but when I let my hair go gray or try a gray wig I just feel so much older. It is in my head and it is something I have to work on in order to grow older gracefully...........hard to do with the skin changes that come with aging! I know people who have gone completely gray and when I hear their age, I always have thought that they were older than what they actually were. On the flip side, a fellow bridge player just turned 80 and you could have pushed me over with a feather when I heard that. She wears more of a platinum blond and her face always has color. Shaded bisquit has that same dark root with a very silvery blond - and in some light the dark roots looked dominant and in other light, they just gave a shadow. Light make such a difference on wigs. I also feel like I look more tired in a gray wig. But, Cathe does not - she just looks great. But I personally prefer her in some other colors. I agree with ya'all. I try not to stereotype. I believe that "agism" is the last Bastian of all "isms." Maintaining ones looks is just another part of being and staying healthy. I am 72 years old and I still like fashion, makeup and WIGS. So I say go for it and enjoy. I am glad you have found a happy place. It sounds like you have been disappointed. I am all for enhancing one's looks. My point is my friends telling me they can't wear gray hair yet have never tried. I tried. I like it. And I would love to know where to find that wig Cathe has on. not sure what you mean, actually. Everyone i have ever met has had disappointments and overall i think i am pretty happy and lucky. If you cannot find that color using google - try sending Cathe a PM. She will not mention a competing company on this forum. I think this is a beautiful color on you. I am 57 and what I don't care for is the in-between yellowish, gray color that hair sometimes goes through to get to the beautiful gray. At some point, I think I will transition to gray, though, because I think it is more natural looking. In my opinion, dark, dyed hair looks unnatural on someone 80 years old. And, my husband already has teased me that people think I'm a lot younger than him, because my hair looks so good, so I may switch out to gray some day so they won't think he's robbing the cradle! It's a new shade. If you google Jamison in new colors I think youll find it!! I really love this beautiful new color on you! Do you mind my sharing this video in another closed group I am in? Someone there was worried about gray making her look older. Vee what's the group. You can copy the video and post. I'm all about that. I hope your friend doesn't think gray makes her feel older!! Thanks! It is a FB group called The Wig Hub. I posted it in reply to a woman asking if her new gray wig made her look old. She actually looked much better in that wig than the one she posted as a comparison. Thank you ladies. I have found the wig. But am still trying to nail the color down. But I have not had a lot of time this week. Well make time for that today. I just had a good laugh looking at some videos online. I had to check out facelift patches after seeing a spectacular video on an older woman applying makeup (and I believe she also used these). She looked so very much better in her after pic - and I am a bit down about my aging skin - whenever I think about it which frankly is not that often. I should mention the tie in - her wig was grey. I think she was at least a bit older than 70 based on the before pic. Now in the after pic - I would guess early 60's because her skin looked so good and frankly the wig looked great. She looked like an older model. So - here is the funny part. The people doing the videos were in their late 20s, early 30s, and the oldest I found was around 40. Seriously????? IMHO - all of us are trying to look better which - for better or worse - in our society we associate with looking younger. I think grey wigs call attention to skin - and if you have great skin - they can look great. just my opinion. Cathe - you do have great skin and everything looks great on you. But in our brains which have been conditioned to see old people in grey - it is likely to call attention to age whether we like it or not. Then you might think - wow looks great for his/her age - or wow they are fit - or wow he/she is young to be grey - or what a cool color - but my point is that we will think about it. With other colors - they are less noticeable during that "transition age period". Now - when you get to be much older - a dark color calls attention. Blondish tends to blend regardless of age. It is just personal preference as to what color to wear - and that includes grey. But, the very fact that we are discussing the grey along with age says that grey triggers the conversation. Again - just my humble opinion. Well, you're definitely right about darker colors! I've been a midnight brown-ie my whole life. When i started wearing helper hair I went for that color. But I realized rather quickly that a lighter shade would look better (softer), and now I'm into the medium browns. Don't think I could ever go lighter than that until I try gray, but you never know. I do have to laugh when I remember the time I saw some early photos of my grandmother. I had always known her as a blonde and I was astonished to learn that she was a natural brunette! I had an awful hard time settling on an Estetica color myself, made even more difficult by the fact that they have 3 colors all with the same number code. Only the letters are different. I finally settled on their caramel kiss rooted which is a beautiful, rich, brunette shade that #cathe wears often. She is very familiar with Estetica products and could probably help you with color choice. Go watch some videos, too! Icathe, I felt the same “aha” when I put on Elle by JR in Oyster. I had been toying with blondes in highlights and frosts, but Oyster was my color. Looking at various sites, I see Jamison in “Chrome” and “ChromeRT1B”. Is there a difference? Chrome RT1B is a rooted color--giving it more depth! You know what? You're correct about the blonde color! I happen to be a blonding fan but the hubs is not--but then again, I don't care. I've been veering toward lighter shades as I've been pro-aging!! And although my original hair color is black--it just looks harsh now!!! All of this way too much fun. Thanks for all of your great suggestions. Glad to hear that the forum has helped you to gain courage to explore new colors! Now the fun really begins! You convinced me! I just ordered my first Jamison (in R6/10). I hope it looks half as nice on me as it does on you! I'm pretty happy with it! I love the color, one shade lighter than my usual R4/8. Just wanted to add that this Jamison is THE most comfortable and natural looking wig I've had so far! It's a bit on the conservative side for me, but I "fun it up" by messing with the part. This'll be my new travel wig -- a real step up from Rene of Paris' Cameron. Cathe, that color suits you beautifully! I love that on you! Colour, style, all of it!! I agree with everything you said regarding my hair. I got a bad batch of hair, it's always been so baby fine, thin & lifeless. It doesn't hold a curl & doesn't hold color for long. Thank God for wigs & hairpieces. I leave out the door lots of times with my hair wet under a wig; who cares no one knows or is going to see my real hair. I can be ready to leave now in 10 minutes. Two things I think makes this gray wig look stylish (beside Cathe!) are the more modern hair style and the dark roots! When we go gray our roots are gray (or mostly gray). On this "hair" the gray looks intentional instead of aging. Cathe is such a cutie, she can rock anything! I wish they had this in lighter roots, or no roots at all. I don't have dark hair so it wouldn't work for me. I do like this wig. Best wig for a larger but not large head? What's your favorite shoulder length wig.